*Alexandra uses the Baking Steel in place of a pizza stone, the Baking Steel has 18x the heat capacity of a ceramic stone. There is nothing I don't love about focaccia: its sea salt and rosemary topping; its soft, airy center; its olive oil-crisped edges. And I enjoy nothing more than ordering a sandwich on freshly baked focaccia from an Italian market, unwrapping the olive-oil stained deli paper, and finding myself with salty, greasy hands with every bite. 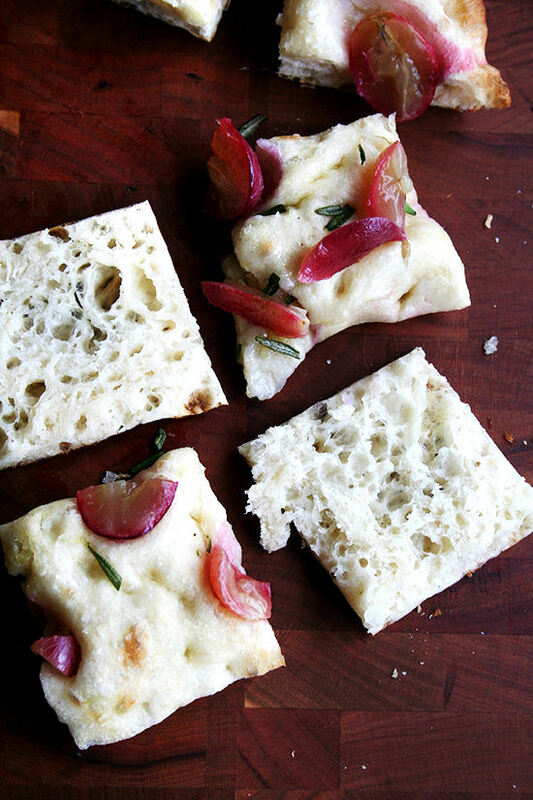 It's a real treat, but making focaccia — true focaccia — can be a labor of love, calling for various stages of kneading and resting and often long, slow rises in the refrigerator. 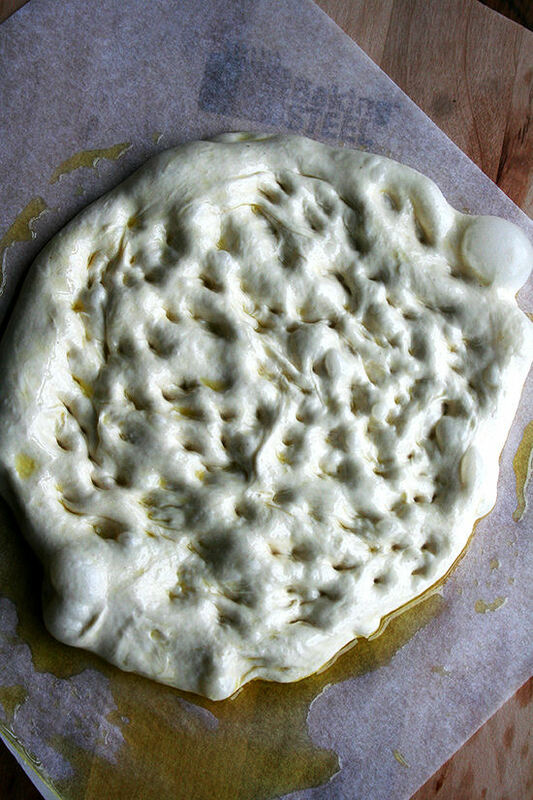 With a slight change to how you handle your favorite pizza dough, however, making focaccia-like breads doesn't have to be so labor intensive. And the shaping process is more forgiving, too: there is no need to use a delicate hand to form the rounds; no risk of depressing air bubbles in the process. The technique, in fact, requires using all ten fingers to dimple the dough's surface, pressing down with force and stretching out simultaneously. Thanks to both a healthy coating of olive oil and the Baking Steel, the resulting round has a crisp exterior with a soft, doughy crumb, thicker than pizza, suitable for eating on its own or halved and spread with creamy cheeses and topped with salty meats. 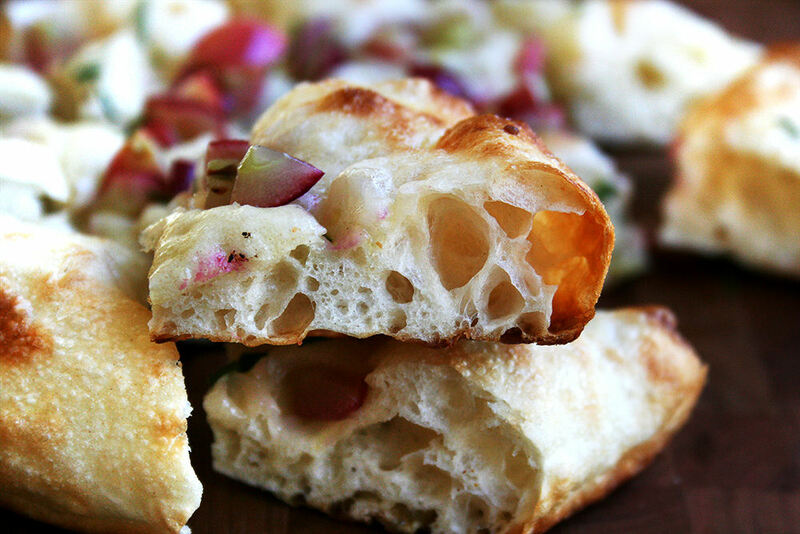 This cheaters' variation is a little less greasy than traditional focaccia, but I think you'll find it no less delicious. 2. About 20 to 30 minutes before baking, remove pizza dough from fridge. Place a sheet of parchment paper onto your pizza peel. Pour a small pool (a tablespoon or so) of oil into the center. Place your dough ball onto the oil, turn it to coat, then using all of your fingers, press down to dimple the surface, stretching the dough ball out as you go. Let rest for 10 minutes. 3. Lightly oil your hands and repeat the dimpling stretching process — the dough should be a little more cooperative at this point. 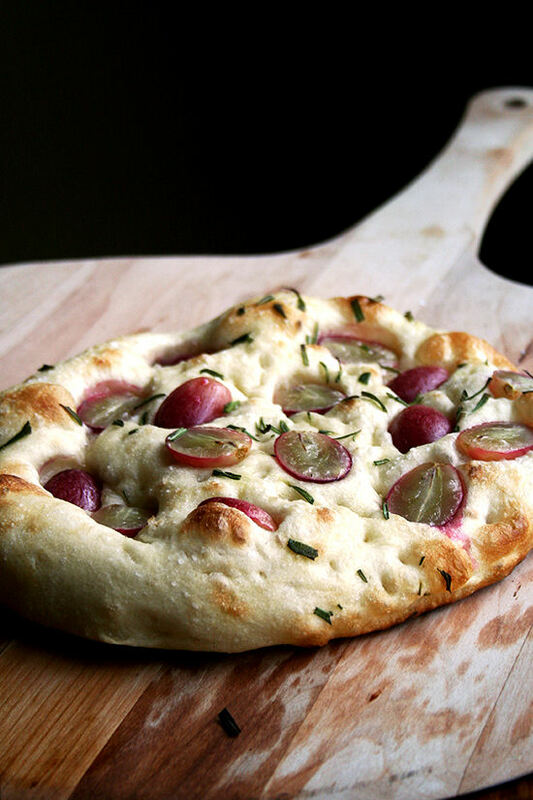 Scatter grapes over top and press them down into the dough — you don't have to use a delicate hand, and as you press the grapes into the dough, you can reinforce the dimples in the dough with your fingers. Season generously with sea salt. Sprinkle rosemary over top to taste. 4. Shimmy focaccia onto Baking Steel. Bake 5 to 7 minutes or until golden. Remove from oven, let cool briefly, then cut and serve. 5. 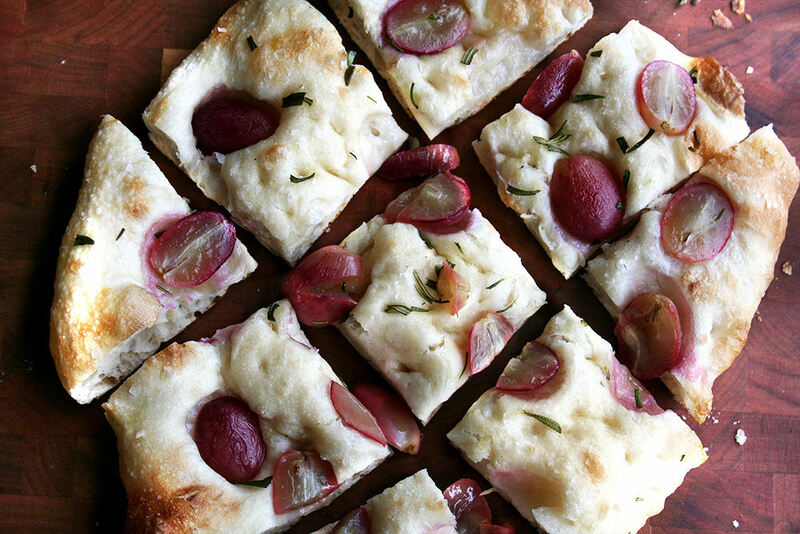 The focaccia is delicious on its own, but a nice creamy cheese like ricotta or burrata complements the rosemary and grapes really nicely, too. A very light drizzling of honey overtop just after the pizza emerges from the oven is also a nice touch. 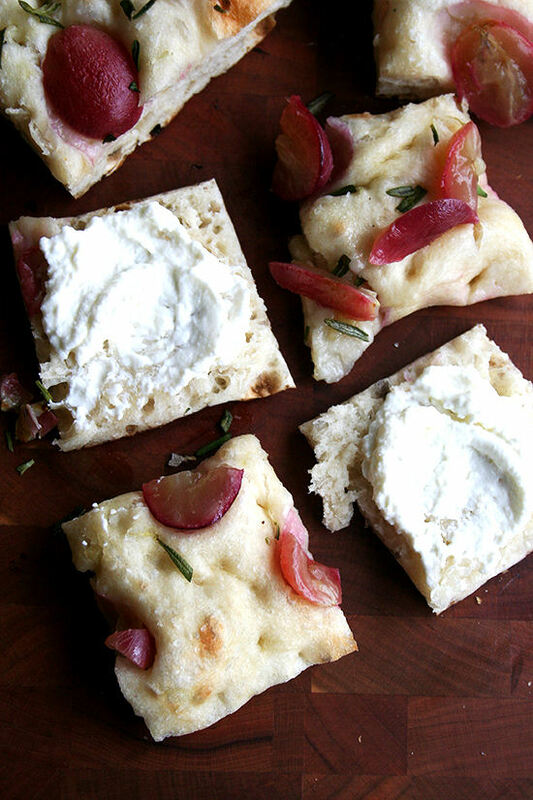 Finally, you can halve the entire round of focaccia, spread one surface with ricotta or something similar, top with the remaining half, and cut into small squares for a nice little appetizer.